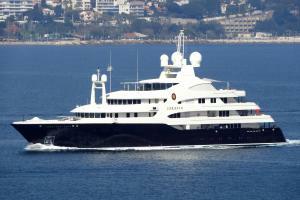 Being mooring line supplier of the superyacht OEM’s in the Netherlands we work only with the best materials and brands. We supply M-ropes and Gleistein to fulfill every individual wish of our clients. We supply mooring lines in various constructions, materials and finishes such as; polyester, nylon, dyneema and eye splices protected with leather or chafe-pro. Please contact us for any request for new mooring lines and we will give you a price and lead-time asap. 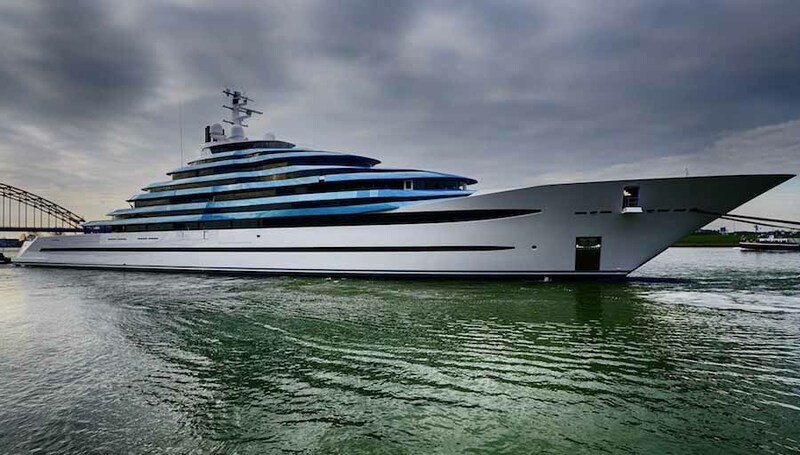 The double braid construction is by far most popular for superyachts. 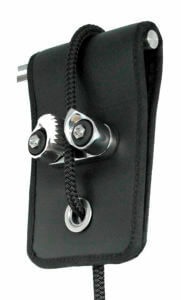 This construction creates great flexibility on the rope which ensures great handling on board. The rope has less tendency to “kink” and therefore is easier to ease or to stow in the boat. 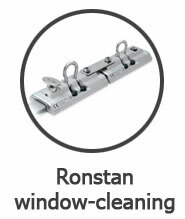 The abrasion resistance is great because of the large surface the 32 plaits create. 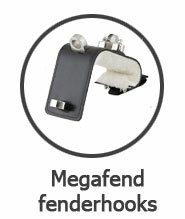 Specially if using our leather finishing or our Chafe-pro protection systems. The amount of twist in the yarn is important for the characteristics of the rope. Lots of twist means very good resistance agaist abrasion, but less flexible. The yarns in the core need different twist compared to the ones in the cover. At More Marine we carefully select and test the best specifications for the best Mooring ropes and so the best protection for your yacht! If you require 3-strand, 8-strand or 12-strand please send us an email with your requirements. Our double braided mooring lines are made with a 32-plait braided cover. 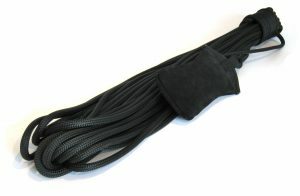 The 32 plaits create a soft and flexible rope. Aesthetically it is being known as the best looking mooring line. The core is twisted and woven for great breaking strength, but also has good stretch. Polyester is by far the most sold mooring line at the moment. 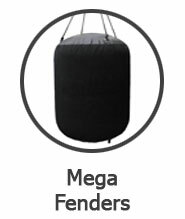 Polyester has a great abrasion resistance, stays flexible and has a good breaking strength. We offer the M32 of M-ropes and Geotwin of Gleistein. Both products are similar in construction and quality with only small differences. Dyneema is a great material for mooring lines; it is lightweight (it floats), strong, has good abrasion resistance, and is reliable. 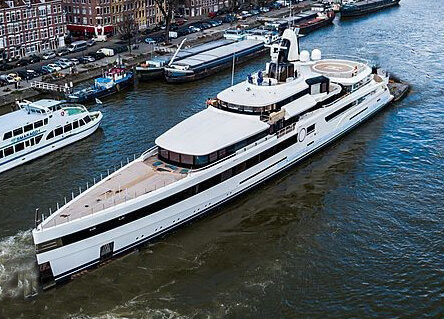 More superyachts are choosing nowadays for Dyneema or Spectra as a core material in the mooring ropes. By using Dyneema mooring lines you can have a smaller diameter and so easier handling. We advise using a polyester cover to protect the rope agains abrasion. Also dyneema is very slippery, and therefore tends to slip. We offer Gleistein Megatwin Dyneema and M-ropes dyneema dockline. Both with 12-strand core and 24-plait cover. 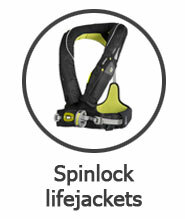 When using dyneema mooring ropes we strongly recommend a polyester or nylon stretcher. Contact us for more advise. 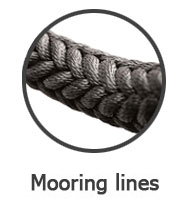 We supply all our mooring ropes including finishing as required by the yacht. 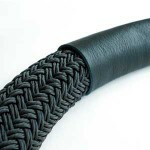 Standard finishing are a 1,5mtr loop, partly protected with leather and the other side whipped. Custom finishing like color-coded whipping, SS thimbles, custom leather etc. are no problem for us. Just let us know your requirements. 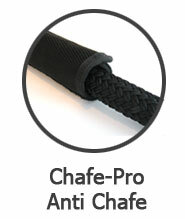 We also supply Chafe-Pro protection in the eye or as separate removable anti-chafe gear. 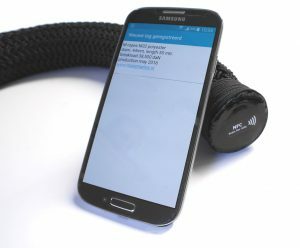 More Marine can supply each mooring line with an NFC chip making it possible to fully identify the rope with your smartphone. This way you always know the length, diameter, breaking strength and date of purchase. Click here for all details. please check our page with heaving lines, monkey fists and sandbags to complete the mooring lines. We basically work with 3 different materials for the mooring lines; Nylon, Polyester and Dyneema. The Nylon ropes have been very successful and popular in the past years. Specially the good stretch characteristics of nylon made it a great mooring rope. The Polyester lines are most popular nowadays. 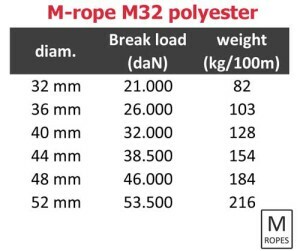 Prices of polyester have dropped compared to Nylon, and the abrasion is much better. 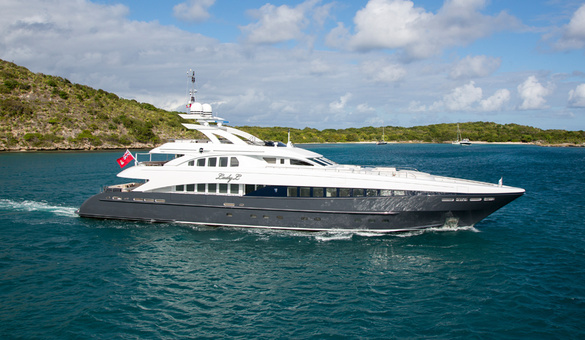 Also polyester mooring lines will stay more flexible during the years. 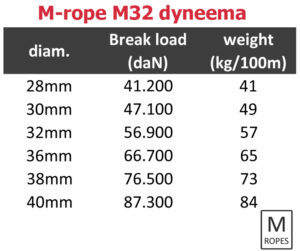 Dyneema mooring lines are upcoming. The huge benefits of Dyneema are the high breaking strength, and low weight. Using dyneema as a dockline result in smaller diameters, less space, and much lighter. The disadvantage of dyneema obviously is the low (almost no) stretch. Therefore we work with polyester stretcher loops which need to be attached between the dock and the dyneema rope in order to provide good stretch into the system. 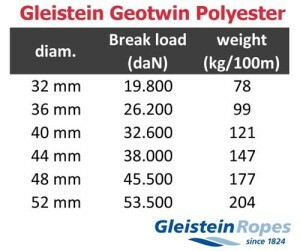 We are using Gleistein Megatwin dyneema with or without polyester cover, depending on the customer wishes. Interested in how our ropes are being made? have a look on our “how it’s made” page.